Put the sujji and oil in a pot along with illaichi seeds and fry until slightly brown on very low heat. Meanwhile combine sugar and water to make a syrup. Add this to the sujji taking care not to burn yourself and cook on low heat to desired consistency. If you want to color the halwa add the color to the syrup before pouring it into the sujji. Place rice in a heavy based pan and add 2-3 cups water. Bring to the boil and keep cooking until you go betond the point you would normally stop at when normally preparing boiled rice. Continue cooking over low heat until most of the water evaporates. Stir cooked rice so that it breaks up into smaller bits and becomes kinda mushy and has a porridge-like consistency. Add sugar and stir. After 1-2 minutes, add milk powder and stir thoroughly until no lumps remain and mixture becomes creamy. You can add 2-3 tbs coconut milk as well for added flavour. Finally stir in coarsely chopped almonds, raisins and cardamom. Cardamom can be substitued by cinnamon or freshly grated nutmeg. Sprinkle with pistachios and serve on its own in small dessert bowls or as a sweet filling for dal puris. Can be eaten warm or chilled. 1. Heat ghee and saute sooji for couple of minutes. 2. Add milk. Keep stirring constantly. 3. Add condensed milk or sugar. 4. Add dry fruits. Stir for couple of minutes. Combine the ingredients for the rabadi in a non-stick saucepan, put on medium heat and bring to a boil while stirring continously. Once it starts to boil, reduce the heat and simmer the liquid until it starts to become thick. Cut the bread pieces into triangles and remove the crumbs. Put a frying pan on medium fire and add about 2 tbsp each of oil and ghee. When the mixture heats up slightly, fry the bread pieces until they turn a light to medium brown on both sides (you would need to do this in batches, adding more ghee and oil – just be careful not to let the oi/ghee smoke). When you are ready to serve, arrange the fried bread pieces in a serving dish/plate and pour the rabadi over it. Let stand for a bit to allow the bread to soak up the sauce and garnish with chopped nuts if desired. If you like you desssert cold, put the serving dish in the fridge for about 10 to 15 minutes, take out and serve. Put sugar, blanched cardamoms and 2 1/2 cups of water in a pan and heat till sugar is totally dissolved. Keep aside. In a thick-bottomed kadai or pan heat ghee. Add vermicelli and keep turning on low flame till golden brown. Add sugar syrup increase flame and cook. Reduce flame when sugar syrup is fully absorbed. Cover and keep on low flame for 5 - 7 minutes till you see steam coming out. Serve hot garnished with chopped almonds and pistachios. 1. In a large bowl mix all the ingredients. 2. Freeze in popsicle moulds or in a bowl overnight. 3. Scoope out the frozen kulfi or the popsicles. Few drops of jalebi (orange red) colour. 1. Sieve flour and bicarbonate of soda together in a bowl. Add yogurt, food color and water. Whisk to a smooth batter. The consistency should be like thin pancake batter. Add little more water if necessary. Leave aside to rest for about 5 hours at room temperature or overnight in the refrigerator. 2. Put sugar, water and cardamoms in saucepan. Bring to boil, stirring until the sugar has dissolved. Boil rapidly for about 2-3 minutes or until a thick syrup has formed. 3. Heat ghee or oil in a deep frying pan or karahi to 170C or 325F. Pour batter in polythene bag or in a muslin cloth and hold it like a piping bag, make about 3mm hole at the base. Pipe jalaibi shape (pretzel shape) into hot oil. Fry both sides for about 3-5 minutes or until crisp. 4. Remove with a slotted spoon, drain on absorbent kitchen paper and then place in the hot syrup for 3-5 minutes, remove with a slotted spoon and transfer to serving dish. 5. Serve warm with green tea or warm milk. Serve Immediately. 1. Soak cashews in milk for couple of hours. Grind to a fine paste. 2. Heat ghee add the cashew paste, cardamon powder and sugar. Keep stirring untill the ghee appears in the corners of the vessel. 3. Pour in a tray. Allow to cool. Cut in to diamond shape pieces. 4. Garnish with silver and serve. 1. Mix together the strawberry, blackberry and raspberry puree. Strain through a fine sieve to remove the tiny pips, then add the elderflower cordial and 200ml (1/3 pint) water. Taste the mixture, adding powdered sweetener, if needed. 2. Freeze with or without an ice cream maker, following the manufacturer's instructions or the method above. 1. Pour the evaporated milk into a large bowl and use a hand-held electric mixer to whisk it until very light and foamy. This will take about 5 minutes. 2. Add the pureed strawberries and whisk again until incorporated. Taste the mixture, adding powdered sweetener, if needed. 3. Pour into a suitable freezer container. Freeze for about 1 hour, then remove from the freezer and whisk well to break up the ice crystals. Repeat once more as the mixture freezes, then freeze until solid. Cardamom (small amount needed to sprinkle over the dessert, halve the cardamom before dressing dessert). 1. Mix all ingredients, starting with the milk powder, self raising flour, oil and finally the egg. 2. Once all ingredients have been mixed, it should form a soft dough. Mould into small round balls. 3. In heavy bottomed pan heat oil for a few minutes warm enough to fry the balls. Please make sure it is on a low heat. 4. Once the oil is warm enough, place the balls in the oil and fry gently stirring the balls around. Please make sure the balls are golden all the way round before taking them out. This may take 10 minutes to fry but as noted make sure the balls are golden all the round. 5. While the balls are frying, prepare the syrup. 6. Place the water in a saucepan and boil with the sugar until the sugar dissolves. 7. Once the sugar dissolves, keep boiling for a few minutes until the liquid becomes syrup like texture. Bring the mixture to a boil. 8. Place the syrup in a dish. 9. Once the balls have turned golden take the balls out and drain the oil completely. 10. Place the balls in the syrup dish and mix gently until the balls are covered in the syrup. Leave the hot sweet dish for a few minutes until the balls are fully immersed in the syrup. Please note that any disturbances will break the balls apart. 11. Lastly, the halved cardamoms can be sprinkled over the rasgulla to add a wonderful aroma. 12. Once cooled, the rasgulla can be eaten. 1. Blend the cornflour with 2 tbsp of the milk. Set to one side. Put the vanilla pod into a saucepan with the remaining milk. Heat until almost boiling, then remove from the heat. Cool and infuse for 10 minutes. 2. Whisk the egg yolks, whole egg and fruit sugar together in a bowl. 3. Remove the vanilla pod from the warm milk and use a sharp knife to scrape out its seeds, adding these to the milk. Whisk the milk into the egg mixture with the blended cornflour. Pour the mixture into a saucepan and heat gently, stirring constantly with a whisk until the mixture thickens. Cool the mixture, stirring often to prevent a skin from forming, then chill it in the refrigerator until icy cold. 4. If using an ice cream maker, pour the chilled liquid into the freezing bowl and churn the mixture, following the manufacturer's instructions. Spoon into a freezer container and freeze until solid. 5. If freezing without an ice cream maker, tip the mixture into a suitable freezer container. Freeze for about 1 hour, then remove from the freezer and whisk well to break up the ice crystals. Repeat twice more as the mixture freezes, then freeze until solid. 1. Bring water, sugar and lemon juice to a boil in a pan. 2. Simmer for a few minutes. 3. Chop the almonds finely and fry them in hot butter together with the semolina until they are golden. 4. Add the hot syrup slowly stirring constantly over low heat until the mixture thickens. 5. Remove from heat and cover the pan. Let cool slightly. 6. Pour into greased moulds and flatten out the tops. Take out and serve warm. 5. Place on ungreased baking paper. If you want to have the real Millies experience then bake for just 7 minutes, till the cookies are just setting - the cookies will be really doughy and delicious. Otherwise cook for 10 minutes until just golden round the edges. 1. Heat oven to 180C/160C fan/gas 4 and base-line and grease a deep 20cm loose-bottomed cake tin. Blitz the ground almonds, butter, sugar, flour, eggs and vanilla extract in a food processor until well combined. 2. Spread half the mix over the cake tin and smooth over the top. Scatter the raspberries over, then dollop the remaining cake mixture on top and roughly spread - you might find this easier to do with your fingers. Scatter with flaked almonds and bake for 50 mins until golden. Cool, remove from the tin and dust with icing sugar to serve. 1. Pre-heat oven to 180 AC/350F/Gas Mark 4. Grease and line two 18cm (7 inch) sandwich tins. 2. Sieve the flour, cocoa and Bicarbonate of Soda into a bowl. Add the sugar and mix well. 3. Make a well in the centre and add the syrup, eggs, oil and milk. Beat well with electric whisk until smooth. 4. Spoon the mixture into the two tins and bake for 25 - 30 minutes until risen and firm to the touch. Remove from oven, leave to cool before turning out onto a cooling rack. 5. To make your butter icing, place the butter in a bowl and beat until soft. Gradually sift and beat in the icing sugar and cocoa powder then add enough milk to make the icing fluffy and spreadable. 6. 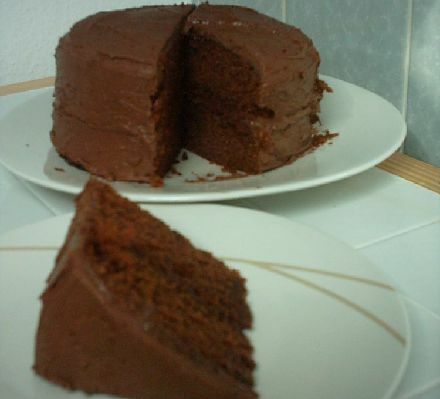 If the cake has risen a little to high then use a serrated knife to even off the top, now sandwich the two cakes together with the butter icing and cover the sides and the top of the cake with more butter icing. 1. Start with the roses. Knead a little of the colouring paste into 150g of the icing until pale and even. Break into three balls, then add a little more colouring to two, giving three varying depths of colour. Keep under cling film. Rub a very thin layer of fat over a smooth work surface. Roll out one of the balls of icing thinly, about 1-2mm, then trim into a rectangle about 8 x 20cm. Cut off a 1cm strip of icing widthways, keeping the rest covered. 2. Carefully roll the icing up and around itself. For a more realistic rose look, start rolling slightly skew-whiff so that the outside edge of the finished rose sticks out further than the middle. With about 2cm to go, start to guide the end of the icing down and under to make a neat rosebud. Pinch to shape, then cut or pinch off the bottom. Set aside for at least 1 hr until firm. Repeat with the rest of the icing. 3. For the leaves, colour the remaining icing green. Pinch off small pea-size pieces, roll into balls, then flatten a little. Pinch one end to make a leaf shape. Leave to dry. 4. Once the roses are dry and firm, dust a little lustre onto each rose using a paintbrush or your fingertip. Sprinkle with sparkles, if using. Position the roses onto the cupcakes in clusters of three, following with three leaves. You'll need 36 leaves and roses for 12 cakes. If you would rather not cook with nuts, swap the ground almonds for 100g more plain flour. The end result will still taste great, but won't keep or freeze quite as well. Use a thin layer of solid white vegetable fat, such as Trex, to roll out icing and stop it sticking. Icing sugar dries icing up too fast and makes colours look chalky. If you want a cake to cut, make a batch of batter and bake in a lined, deep 20cm round cake tin at 190C/fan 170C/gas 5 for 40-45 mins. Serve on a pretty cake plate, topped with frosting and roses. The roses can be made up to a month ahead and coloured to match the wedding theme. Keep in a cool place away from moisture and light. 2. Grease and line 2 x 18cm/7in cake tins with baking paper. 3. Cream the butter and the sugar together in a bowl until pale and fluffy. 4. Beat in the eggs, a little at a time, and stir in the vanilla extract. 5. Fold in the flour using a large metal spoon, adding a little extra milk if necessary, to create a batter with a soft dropping consitency. 6. Divide the mixture between the cake tins and gently spread out with a spatula. 7. Bake for 20-25 minutes, or until golden-brown on top and a skewer inserted into the middle comes out clean. 8. Remove from the oven and set aside for 5 minutes, then remove from the tin and peel off the paper. Place onto a wire rack. 9. Sandwich the cakes together with jam, lemon curd or whipped cream and berries or just enjoy on its own. 4. Bake in the oven for 8-10 minutes, or until golden-brown on top and a skewer inserted into one of the cakes comes out clean. Set aside to cool for 10 minutes, then remove from the tin and cool on a wire rack. 5. For the icing, sift the icing sugar into a large mixing bowl and stir in enough water to create a smooth mixture. Stir in the food colouring. 6. To ice the fairy cakes, drizzle the icing over the cakes, sprinkle with decorations and set aside until the icing hardens.